The European Union has decreed that contracts between EU member states and Israel must include a clause stating that east Jerusalem and the West Bank are not part of the State of Israel and therefore not part of the contract, it was reported on Tuesday. The EU’s funding, direct and indirect, of Israel bodies which operate in the settlements has long drawn fire from various organizations within the Union. 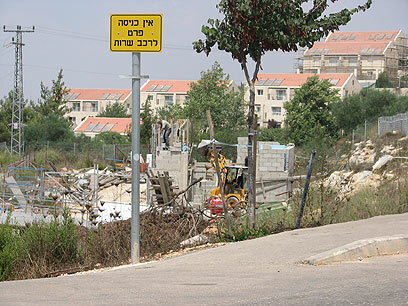 The EU is severely opposed to Israeli construction beyond the 1967 lines, and has acted repeatedly to draw a clear line between Israel and its settlements in the West Bank. However, the directive will not harm funding for research institutes, such as the Hebrew University, which employs settlers in their staff. Government ministries which have offices in east Jerusalem, such as the Justice Ministry, will still enjoy the EU’s cooperation as well. Deputy Minister in the Prime Minister’s Office MK Ofir Akunis said in response that “it’s a wrong and regrettable decision. Such steps – even before the Palestinians announced they are even ready to return to the negotiation table – are pushing the peace talks away, not drawing them closer. Some in the Israeli Left congratulated the EU’s decree, and accused the government of bringing it upon itself for not pursuing the peace process. “The EU is benefitting Israel by marking the border which the Israeli government failed to mark,” said Meretz Chairwoman MK Zahava Gal-On. “This isn’t a boycott of Israel, but a distinction between Israel and the settlements and the occupation. The decision is the result of the complete impasse in the peace process and continued construction in the settlements and outposts,” she added. That’s ok. Israel will peddle its bloodlust goods to its captive controlled puppet market: the USA. How about similar sacntions imposed on Iran? Why? They are living in their own territory and not usurping other people’s land as Israel does. Surely you mean how about imposing sanctions (on Israel) that are similar to the ones being imposed on Iran? Is ra el has products? Rather not! I wouldn’t trust the EU with that boycott, because the foreign affairs are represented by the British. Israel – this “spoiled child” of Internacional Zionism remains THE ONLY THREAT to peace on this planet. UN decision after WW2 /well prepared by Zionists from begining of 20th century/ was the most tragig and embarising…..Mankind will yet to dearly regret this deaply tragig move. Mankind in 4 cornes can see and read the most rasist, arrogant behaviour coming from this truly satanic entity almost daily…..I wish Truth Jews played more active role against this last blashemy this tribe of fanatics allowed to happened….Nowhere in any Holy Books God promise to protect these kind people, opposite is truth!!!!!. Their constant rebelion against God principals ended in Diaspora…Truth Jews obey this last comand and reject this “unbiblical shortcut to promised land through theft and murder rejecting Jahwe” …. Israel is plainly one lastbig horror unjust colonization project – I thing soon or later this Colossal theft of land and ongoing never ending aggression togheter with their sponsored terrorism may bring the World to WW3 scenario and after ????? PS. rest in peace You slotered Palestine childern, all who were murdered by Fanatic who simply : 1.” Put Man above God” and 2. “Put Talmud above Torah”…. All nations, even religions made mistakes, but Zionism remains on the top of “manmade satanism” ….till end days…..
Iran has no place in this discussion. This discussion is about a mythical gangster nation called Israel that is temporarily stealing land that does not belong to them and never will. The big blow is going to be Aldi, they are a huge pan European chain with branches too in Asia and Russia and no amount of threats, coercion etc will shift Aldi and it is rumoured Lidl’s are going to follow suit which is another huge pan-European chain. This is going to really hurt economically and hopefully as this gains traction we will see other nations and groups following suit. As the old adage says… Money talks.